The enterprise-software specialist bounced back from a weak market performance in 2016 to score a rip-roaring gain in January. Will this turnaround have legs? 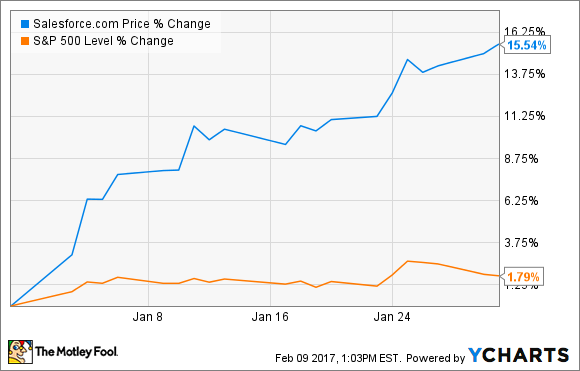 Shares of salesforce.com (NYSE:CRM) rose 15.5% in January of 2017, according to data from S&P Global Market Intelligence. This month-long surge started on Jan. 4, when the company published a "state of the service" report that painted Salesforce's target market in bright, cheerful colors. The momentum continued as several analyst firms issued positive research reports on the stock, often describing it as a probable turnaround winner. Finally, as January wrapped up, rumor had it that Alphabet (NASDAQ:GOOG) (NASDAQ:GOOGL) might be preparing a buyout offer for the company. Of course, Alphabet has not presented any takeover bid for Salesforce, and I'd be surprised to see it happen. January's burst of share price gains came after a disappointing 2016 as a whole, setting the bar low for quick gains. Is there a solid turnaround on the horizon? Salesforce does generate plenty of cash, but the stock valuation remains firmly in the nosebleed section. The stock is simply priced for absolute perfection. I'm more than comfortable staying on the sidelines -- but sudden price drops could make Salesforce shares interesting. This one goes on my long-term watch list.